How can companies share knowledge instead of just collecting information? 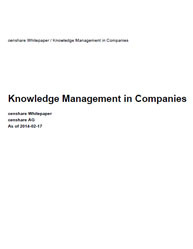 Knowledge management in companies is far more than the administrating and managing information or especially documents, and pertains equally to internal collaboration as well as to external communication. Knowledge management must be anchored in the company as a strategic task! Download this whitepaper and discover how you can unlock the valuable knowledge trapped within your company through knowledge management processes. It focuses on: Role of effective knowledge management in companies- What should the organization do to manage knowledge effectively Success criteria for effective knowledge management Common Challenges faced while implementing knowledge management Benefits of integrating knowledge management in a comapany Managing the processes to get the right knowledge form your company's data This whitepaper will help you understand the power of knowledge management in companies and equip you with the tools needed to deliver that power and augment the intelligence of your organization.